The TS-2000 on AM... 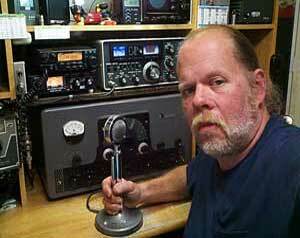 Recently (late spring of 2011) I have been playing with AM on the HF bands (75 & 40 meters). 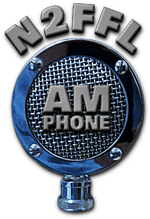 I've listened to the "AM windows" on HF on and off for many years and even worked some AM on 6 meters many years ago with a Swan 250 that I used to have. Well I finally took the plunge and spoke. My first AM QSO was on 75 meters with none other than WA1HLR, Tim (the Timtron). I never thought anyone would hear my PW (piss weak) "ricebox" station but was pleasantly surprised! Just running my Kenwood TS-2000 (25 watts out on AM) into a fan dipole. I am using an old (30+ years) Turner +3 desk mic which seems to work well with TS-2000. No amp for the time being. I've found AM to be a pretty relaxing mode with more natural sounding audio than SSB. There's mainly ragchewing going on on AM with none of those, as I call 'em, hit and run QSOs that seem so prevelent on SSB (you know the type... ur 59... 59... 59 in Eastern Slobovia... QRZed... QRZed). While working DX is fun it's nice to get to get on the airwaves and actually have a relaxing conversation with another ham. The Drake TR-4... After 6 years of having my TR-4 kicking around I finally got a microphone for it (actually a friend gave me a mic). After an alignment it finally made its debut on the air in July of 2011. After about a week of use one of filter caps in the power supply quit. One power suppy rebuild later the rig was back on the air and working great. I did a couple of simple mods and installed a small fan for air movement. For details on the rig see my Drake TR-4 page. According to its serial number the old girl was brought into this world in the late summer of 1965 so she's only 5 years younger than I am. 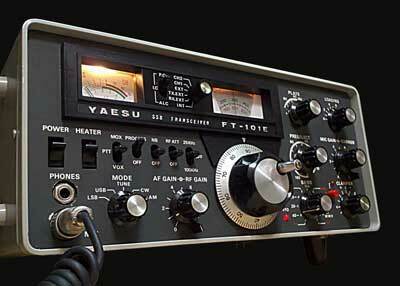 The Yaesu FT-101E (late 70s version)... this is the latest addition to the ham family here. I've always wanted one of these rigs and I finally spotted one at a local hamfest (JSARS fest 8/2011). The price was right so I snatched it up. This rig will produce over 100 watts of carrier on AM but it's not designed to produce that much power continuously. I run it at about 35 watts on AM. For more details check out my FT-101E page. 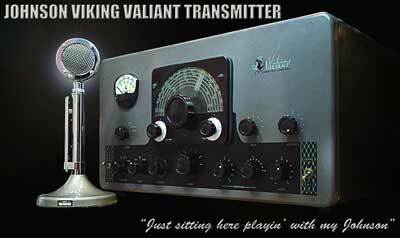 Picked up a Johnson Viking Valiant 160 - 10 meter transmitter at the GSARA hamfest (Sept, 2011). This is a heavy piece weighing in at 83 pounds. It's in good shape, clean and produces over 100 watts continuous carrier. It looks to be all original and no one has been inside hacking things up. It was fully functional when I got it but needed a little work (power supply rebuild, audio mods). This old beauty is now my primary AM transmitter and the centerpiece of my station. More about my Valiant HERE. 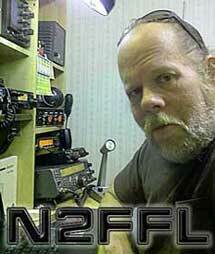 Lately (fall of 2011) 10 meters has been open every day so I've been hanging up around 29.000 MHz AM during the day. It doesn't take much power up on 10 to make contacts. Some of the stations I've worked in Europe were only running 25 watts and I worked a station in Louisiana who was running an old converted Johnson CB rig at 7 watts of carrier. I've worked a number of stations with just 25 watts myself and even had my FT-817 on AM and worked Northern Ireland with just 1 watt and my homebrew 5/8 wave wire groundplane antenna! Usually I have the Valiant tuned up on 10 meters during the day and at 120 watts carrier I have a pretty good signal. I've always heard "Don't play with your Johnson!". Finally I have a Johnson worth playing with and I'll play with it all I want! I picked up a Tektronix 2230 dual trace 100 MHz DSO (digital storage oscilloscope) for a great price on Ebay with two probes. I noticed that most of the scopes sold on Ebay don't come with probes. Some don't even include the power cord! While you can get "Chinese" probes cheap genuine Tektronix probes can be quite pricey, forty dollars or more for used ones. The scope I picked up is in like new condition even though it's 20+ years old. 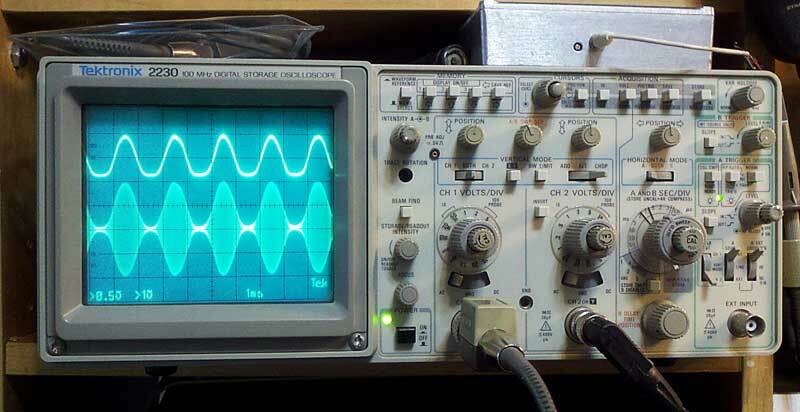 A scope is a very useful instrument that allows you see waveforms in a circuit, measure voltage and frequency. 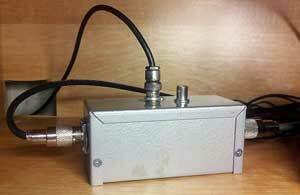 It is also the only way you can "see" your transmitted modulated signal. A "monitor" scope will will also do this but is pretty much restricted to that function only. 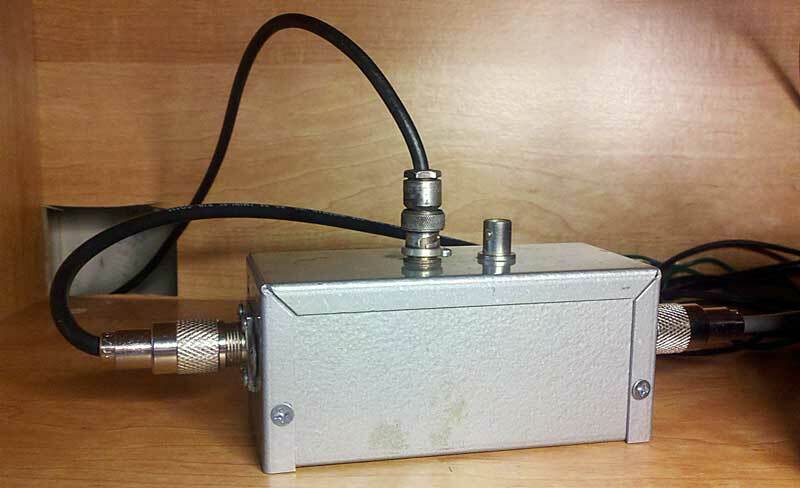 After I got the scope I built an RF sampler that picks off a small bit of RF from the feed line and feeds it to the scope. 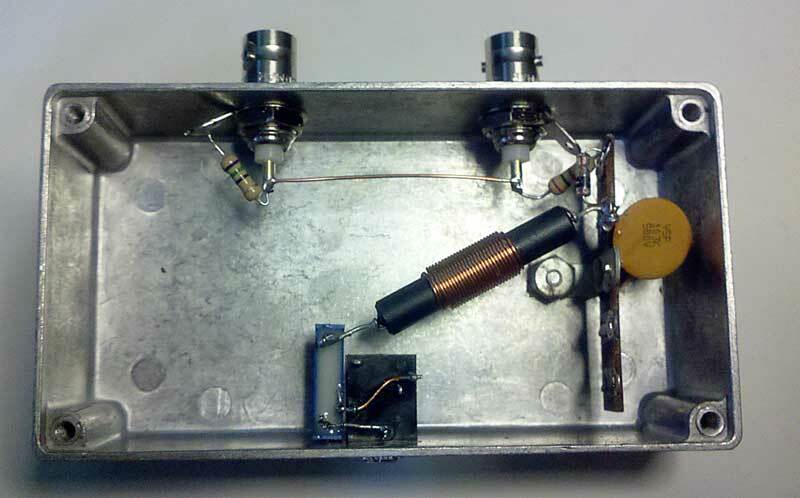 I found the design for an inductive RF pick up and demodulator on KA2QFX's site here. His design works great! It also will drive a pair of headphones for monitoring the transmitted audio. 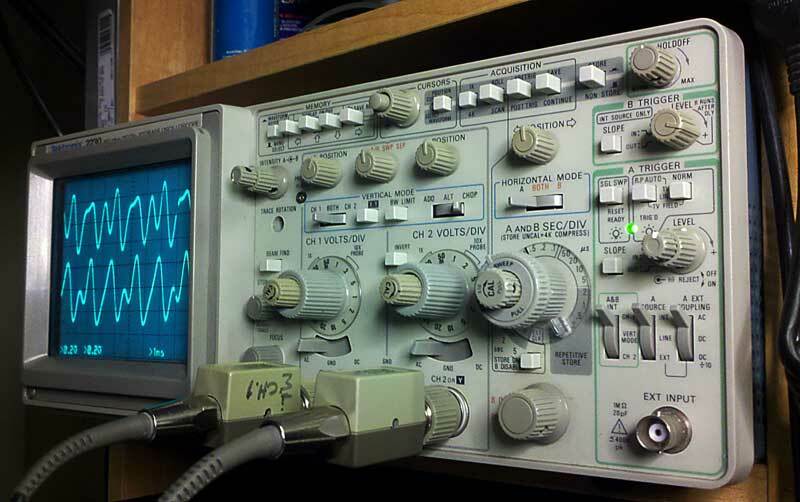 The RF sampler. I used double windings on the toroid to provide two separate outputs and RG-8 coax in the center. The toroid core came out of an old computer power supply. Only one end of the coax braid is connected to ground the other end of the braid is not connected to anything. The finished RF sampler inline. 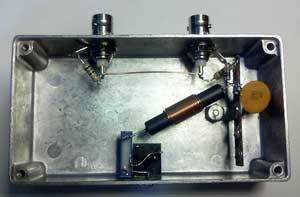 Interior of the demodulator / scope output box. The right BNC is the input from the RF sampler, the left BNC is the output to one of the scope vertical inputs. 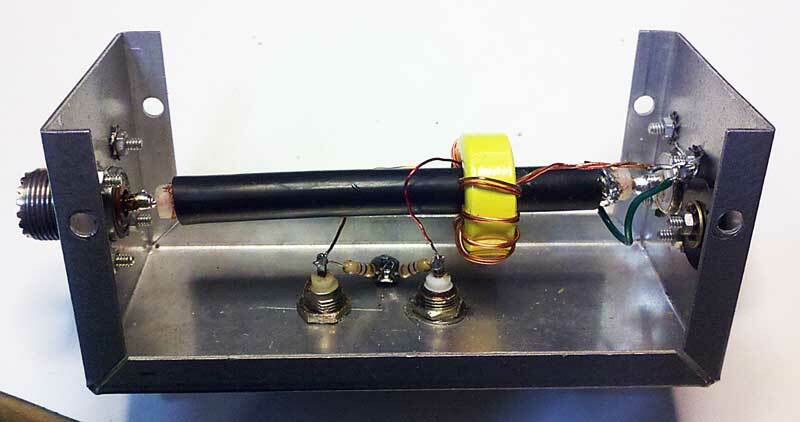 The 1/8" phone jack at the bottom provides demodulated audio to drive headphones or can be connected to the other vertical input of the scope for a trapzoid display. 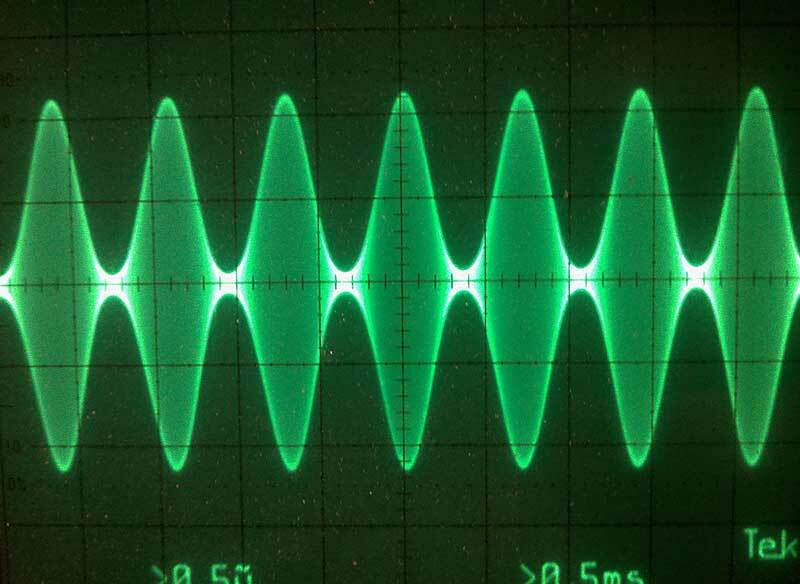 Scope displaying about 125% modulation transmitting 1 KHz audio. Note the tops of the signal are round as well as the valleys. 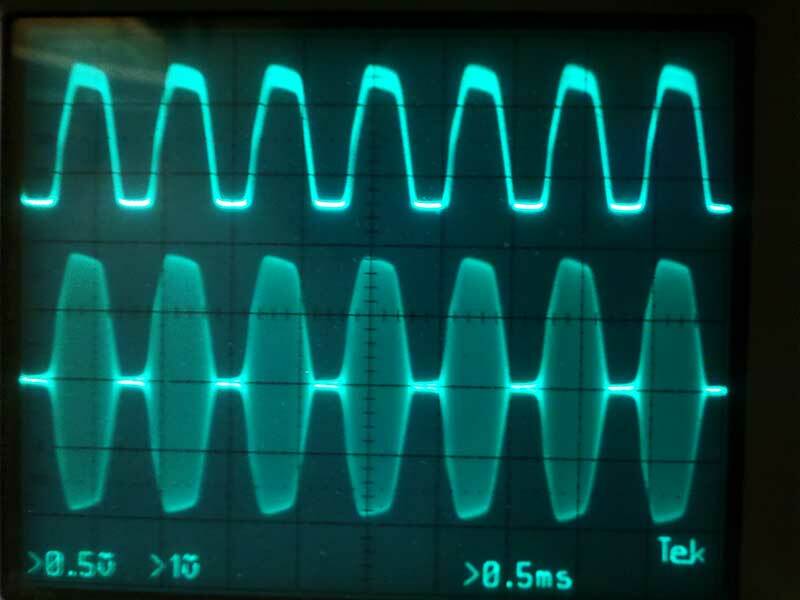 Showing 125% modulation (lower trace) and demodulated audio (upper trace). 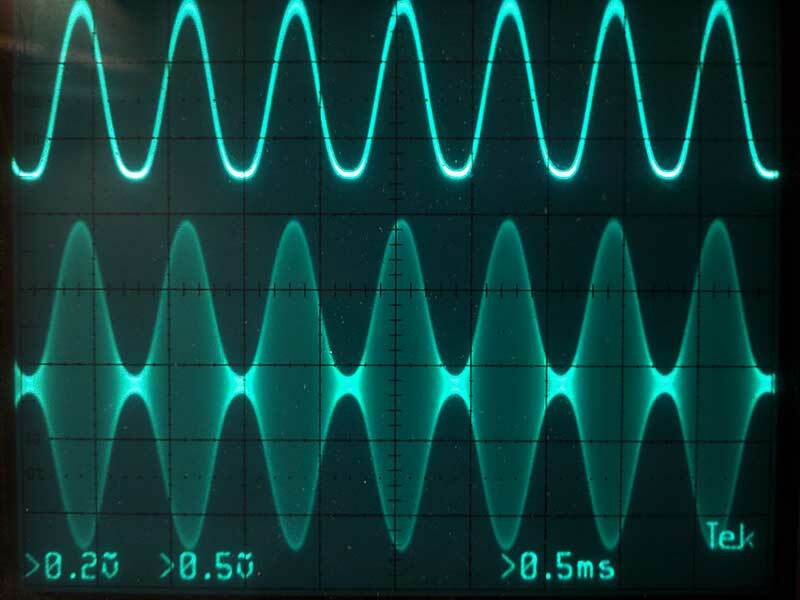 Showing overmodulation. Notice the flat tops on the signal and "pinching" at the center. Trapazoid display. 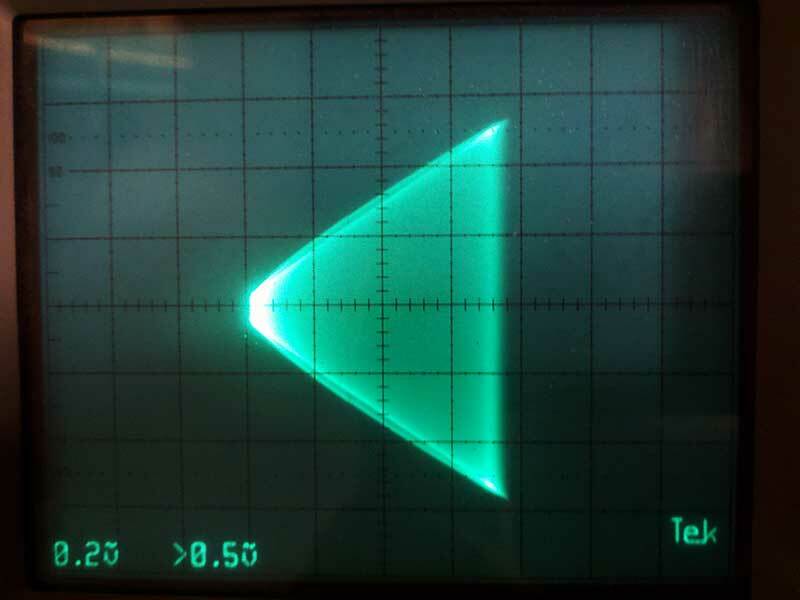 With the scope in X-Y mode the RF signal is fed into the Y input and the demodulated audio is fed into the X input producing this display. The upper and lower sides of the triangle should be straight and not bent or curved. 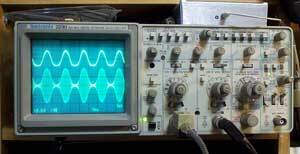 You don't need a 100 MHz scope for use as a modulation monitor. Just about any old scope will do just fine. 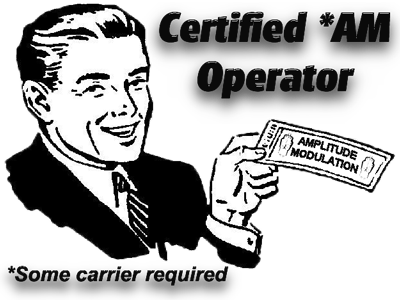 Retro-75 - 75/80 Meter AM Transceiver board kit. The AM Press/Exchange - This section of AMfone is brought to you by the volunteers that made it possible.Currently, only issues of the past are being re-published on the web. Geez, I thought the antenna was connected!